Chickenpox has finally arrived. We’ve had a few brushes with infected children in the past and never been “lucky” enough to catch it! This time the biggest one has brought it into the house. I always hoped we’d get it before the twins arrived so I wouldn’t have to deal with 4 infections at once but it looks like that is my destiny. The boys just fancied colouring in today. Nothing too exciting as I think he was feeling pretty sorry for himself. I thought I’d join in with the activity too! It would be rude not to and I find it strangely therapeutic. I bought some picture beads a few weeks ago as an emergency activity for a rainy day. Today was the rainy day. B loved this an spent well over an hour designing a star. 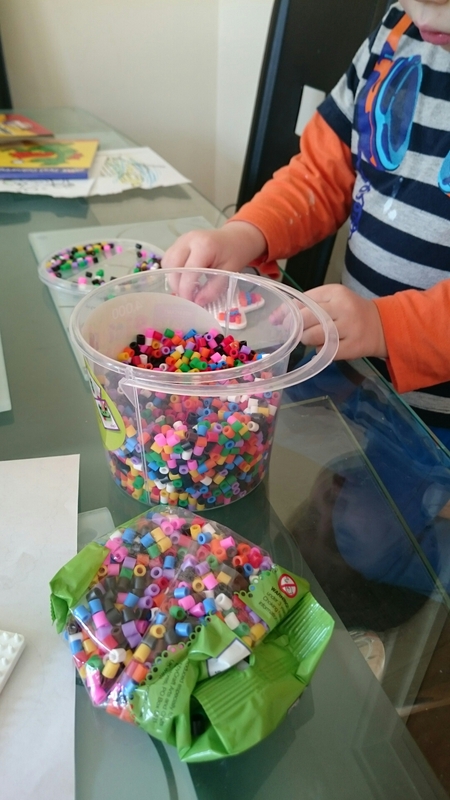 O on the other hand just wanted to stick his clammy hand into the beads and spread them everywhere! 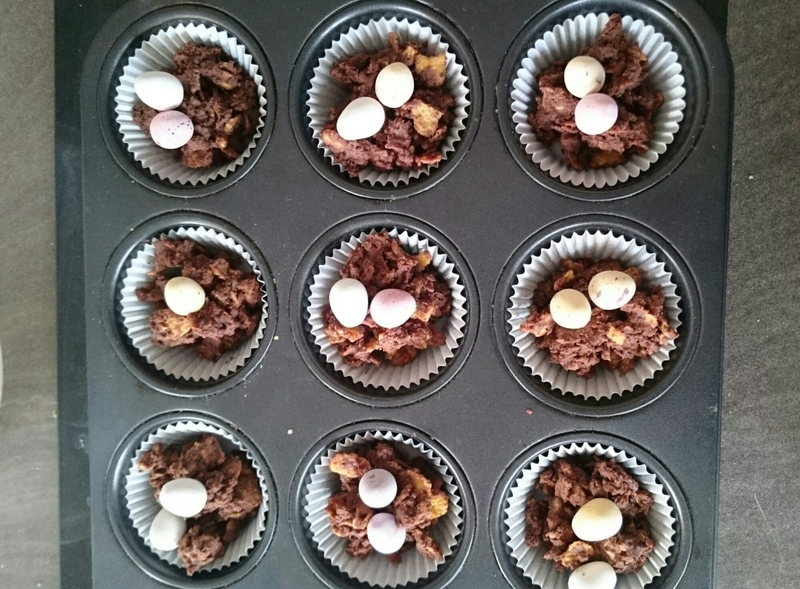 A seasonal activity today with the creation of chocolate easter nests. This didn’t go quite as planned and most of the Mini Eggs got consumed before they got onto the nests! Tears were shed. A day off childcare for me – well, sort of. The boys normally go to nursery today then onto their grandparents for a few hours. No nursery this week for B but the grandparents still agreed to have him. Craft of today was salt dough. 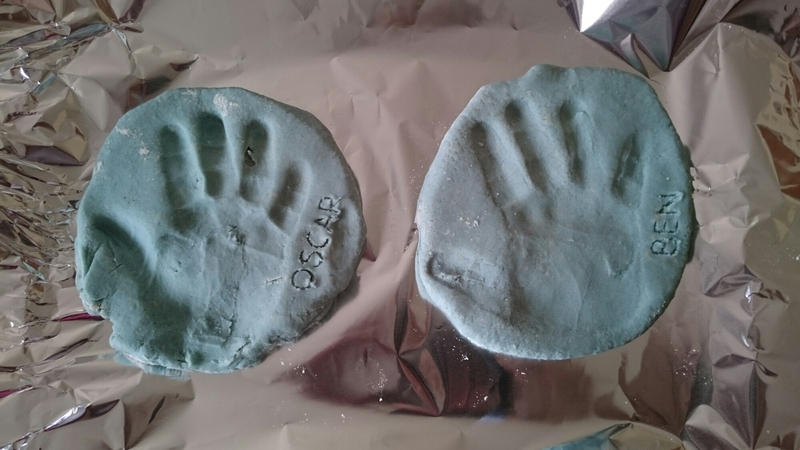 We made hand and footprints that I can hang around the house and remember how small my children once were. 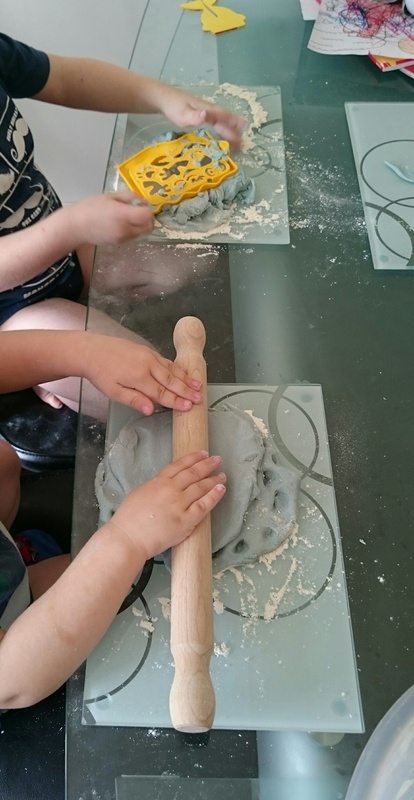 The boys loved this as it involved getting pretty messy and watching Mummy stress as little bit of dough end up everywhere! I think we’ve managed to avoid too much boredom this week. Now is the countdown to see if the other 3 catch it and we have to get crafty again! I’m hoping they get it too but, every day that passes, the chances are getting smaller. It’s been 2 weeks now! Lots of fun activities there. 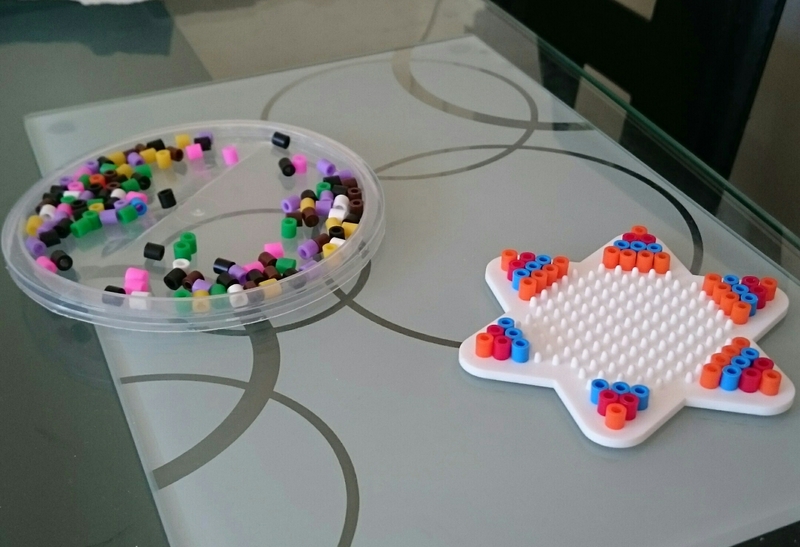 Colouring in is one of my favourites (I have an adult colouring book) The beads and star set looks like something my daughter would enjoy. Sorry you’ve had a rough trot. I do love the poorly cuddles you get when they’re sick. It’s the only time my boys want cuddles. All 4 have had it now so that’s that done! Hope your 2 catch it before they get too big. The babies coped so much better with it than the bigger ones. The other 3 have all just got over chickenpox. They managed to catch it together. Thankfully they weren’t too poorly with it! Hope your children your son feels better soon. Looks like you’ve had a good creative week despite being poorly. 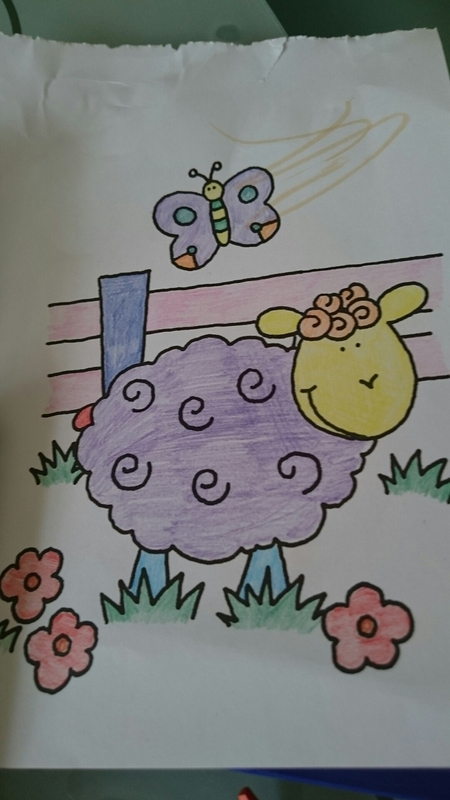 You have to keep the boredom at bay when chickenpox strikes. It certainly diverted his attention for a while so objective achieved I think!